Greater Manchester Fire and Rescue Service will be saying goodbye to Watch Manager Paul Hesford who is retiring after 40 years of service. Paul first joined the Service in 1978 after completing his basic training at London Road Fire Station and currently works as a Watch Manager at Moss Side, a position he has held since September 1997. 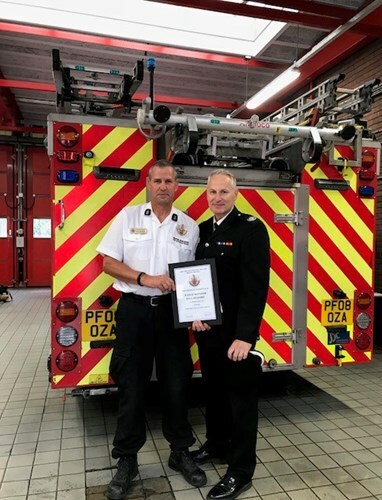 Throughout his career he has always remained in an operation role, serving the communities of Greater Manchester as a firefighter, leading firefighter, sub officer, station manager and watch manager. He said: “In my career, I have been fortunate enough to work alongside many great people who have become much more than just work colleagues. I feel very lucky to consider so many of them as good friends and I look forward to meeting up with them in the future at some of the many social occasions we have. As well as working as a watch manager, Paul plays a vital role in AIR Unit team – a position he has held since 2015. This role sees him attending large-scale incidents and providing invaluable aerial footage that can be used to help downscale incidents. On Paul’s 40th work anniversary earlier this week, he found himself doing just that at large-scale recycling plant fire in Salford. Reflecting on his time at GMFRS, Paul said: “I am very proud of the service that we all provide to the communities of Greater Manchester and I know that every individual that makes up the Service is passionate about protecting the communities of Greater Manchester. “Within my time, I have been involved in many extremely challenging incidents and situations, but there have also been far more rewarding occasions which have helped prove how much members of the public value the work we do every day. Colleagues and friends of Paul gathered at Moss Side community fire station last week for a farewell presentation and a thank you for his hard work. Moss Side Station Manager Ian Redfern said: “Forty years and two days ago Paul joined the service and he stands here today as one of the most experienced officers. Area Manager Billy Myers said: “We are here today to celebrate a milestone in the service. “I can hand on heart say that there’s not a better watch manager in the service. Paul’s a great leader, supportive and committed to his role within GMFRS. He has stayed with his watch on the engine for all these years and he will certainly be missed.